Pastel is pure pigment, the same pigment used in all media. It is the most permanent of all when applied to conservation ground and properly framed. Pastel has no liquid binder that may cause the surface to darken, fade, yellow, crack, or blister with time. Pastels from the 16th century exist today, as fresh as the day they were painted. Pastel does not at all refer to pale colors, as is commonly used in the cosmetic and fashion terminology. The name Pastel comes from the French word, "pastiche" because the pure, powdered pigment is ground into a paste with a binder and then rolled into sticks. The infinite variety of colors in the Pastel palette range from soft and subtle to hard and brilliant. An art work is created by stroking the sticks of dry pigment across an abrasive ground, embedding the color in the "tooth" of the paper, sandboard, canvas, etc. 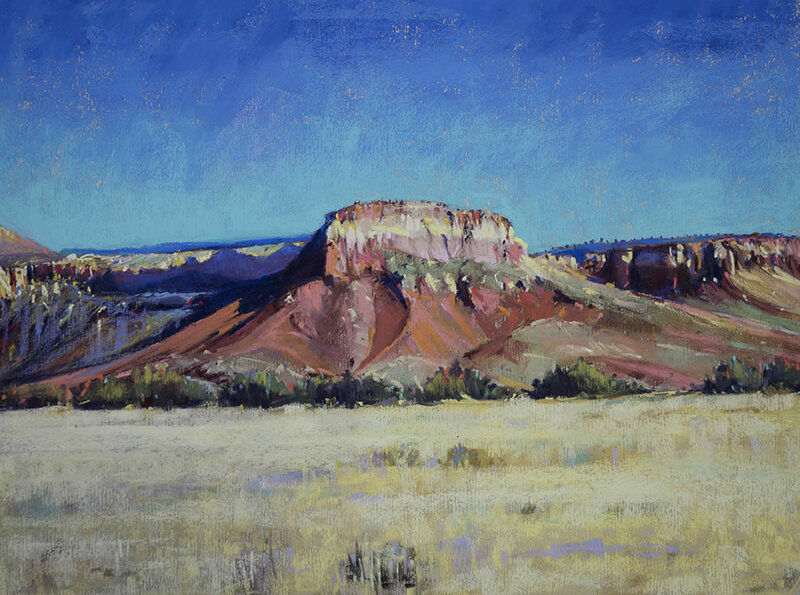 If the ground is completely covered with Pastel, the work is considered a Pastel painting; leaving the ground exposed produces a pastel sketch. Techniques vary with individual artists. Pastel can be blended or used with visible strokes. The medium is favored by many artists because it allows a spontaneous approach. There is no drying time and no allowances have to be made for change in color due to drying. A particle of Pastel pigment, seen under a microscope looks like a diamond with many facets. Therefore, Pastel paintings reflect light like a prism. No other medium has the power of color or stability. Pastel does not oxidize with the passage of time. Historically, Pastel can be traced back to the 16th century, Its invention is attributed to the German Painter Johann Thiele. The Venetian artist Rosalba Carruera was the first to make consistent use of Pastel. Chardin did portraits with an open stroke, while La Tour preferred a blended finish. Thereafter a galaxy of famous artists such as Waateau, Copley, Delacroix, Millet, Manet, Renoir, Toulouse-Latrec, Vuillard, Bonnard, Glackens, Whistler, Hassam, William Merrit Chase. *Reprinted from the 1990 Pastel Society of America Catalogue, with permission of the Pastel Society of America.